Food is an essential part of the Brazilian culture. With a mix of African, European, and Amerindian ancestors, the food in Brazil ranges from world-renowned steakhouses to beach street food. 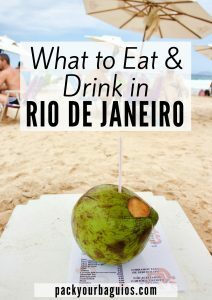 During our recent visit to Rio de Janeiro, we had the advantage of having a local give us tips and recommendations of what to eat and drink that we just had to try! Click here for special Rio de Janeiro hotel deals! When my Brazilian friend, Aline suggested that we try a Churrascaria (barbecue) Rodizio (all-you-can- eat), I questioned her to whether or not it was a traditional Brazilian place to eat. There’s a Brazilian steakhouse where we live in Memphis, and I always assumed it wasn’t authentic, like the food served at Outback Steakhouse. I was assured that Brazilians love going to a churrascaria rodiazio. It goes along with the Sunday afternoon barbecues that are also a tradition. 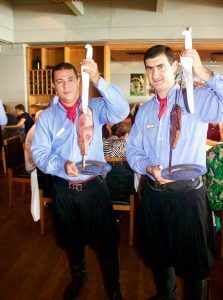 If you’ve never been to a Brazilian steakhouse, the waiters go around with different types of meat on skewers. You have a card with a red side and a green side. When you want more meat, flip the card over to green. If a waiter stops by, and you don’t want what he has on his skewer, just say no. The importance of fish in the Brazilian diet comes from its Portuguese influence. Pretty much every restaurant will have some type of fish dish. I think I had at least one meal that included shrimp every other day of our visit! Moqueca de camarão is a dish that was shaped by the mixing of African and Amerindian cultures. 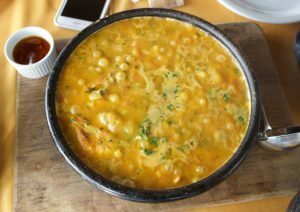 It is a staple dish in the northeastern part of Brazil. Coconut milk combined with strong spices give the stew its thick orangish color. It is usually served piping hot in a huge bowl that is meant to be shared. This bubbling bowl fed four of us with some left over. Black beans and rice are a staple in Brazilian homes and restaurants. Think mashed potatoes for American meals. When we were in Brazil, the only time we didn’t have beans and rice was at breakfast and when we were eating on the beach. If the beans have meat mixed in it, it is called feijoada. Feijoada is considered the national dish of Brazil. 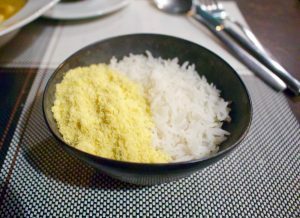 Commonly offered next to the beans and rice is farofa, a flour made from the root of the manioc flower. Farofa looks a lot like sand, and the consistency ranges from larger grains to a finer powder. Although it can be eaten as a side with a main dish, it is usually sprinkled on or mixed in other foods. I loved it mixed with my beans and rice! Mix farofa with other foods or eat by itself. Commonly sold on the beach and street stands is pastel, a fried pie typically filled with cheese, shrimp or beef. You can find pastel sold as appetizers in restaurants, in beach stands, and by strolling beach vendors. 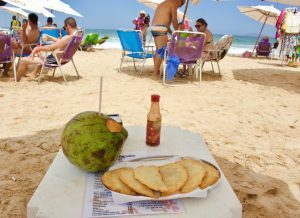 Queijo coalho is a fast snack that you’ll find on many Brazilian beaches and is soooo good. The cheese is heated in homemade grills then sprinkled with oregano or other spices. It doesn’t melt much, but the grilling gives it some texture. Açaí is a made from the fruit of a particular type of palm tree native to Central and South America. It is a dark purple color, and the consistency is similar to a slurpee. It is served very cold. You will find açaí stands on street corners and being sold in carts on the beach. It has become very popular with surfers and other athletics looking for a quick, healthy boast of energy. Most vendors will give you the option of different ingredients to sprinkle on top. We found empadas being sold by beach vendors and as appetizers in restaurants. An empada is like a little meat pie, similar to a pastel, but baked instead of fried. The most common filling is chicken, but I like the ones filled with shrimp (camarão). Like many of Brazil’s traditional foods, pão de queijo originated from African slaves. It has many different versions, but most varieties contain cassava flour mixed in a ball with various cheese. Unlike “stuffed bread”, the cheese is mixed with the flour. It is light with pockets of air inside. 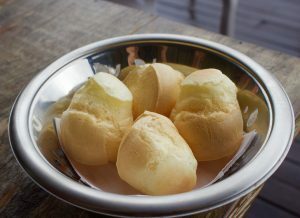 It is sold in grocery stores, bakeries, as appetizers in restaurants, and on the beach, with vendors carrying the pão de queijo in heat retaining boxes. It is utterly delicious, and I could eat the little bites of heaven every single day! 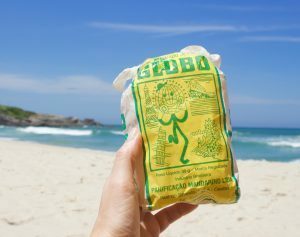 Globo Biscoitos are a beloved beach snack that has been around for the last 50 years. The little bags contain circle-shaped puffed chips which are primarily tasteless. Brazilians love this iconic snack so much that when a New York Times reporter criticized the snack during the 2016 Olympics, he became the target of a Twitter attack from thousands of upset Brazilians. The snacks are sold in two varieties, green label- salgado (salty), and red label- doce (sweet). Joe drank this every chance he got. 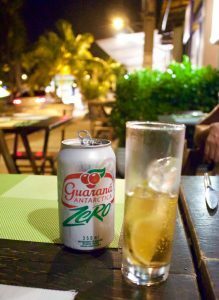 Guaraná is a guarana-flavoured soft drink. Guarana is a climbing plant in the maple family. The flavoring from the plant is slightly apple-flavored, and the soda looks a lot like ice tea. It is Brazil’s #1 soda and comes in cans and 2-liter bottles. 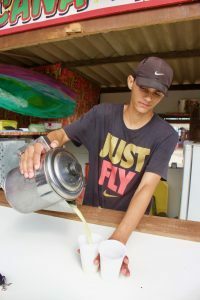 Caldo de cana (also called garapa) is literally “sugar juice.” Made by pressing sugarcane through a press, the juice extracted is a greenish-yellow. It is available everywhere. What you end up with is 40%-50% sugar. Trust me, a little bit goes a long way! 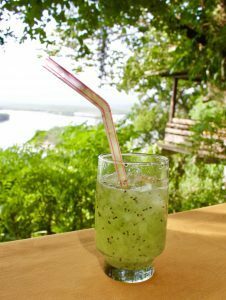 Caipirinha is Brazil’s national cocktail. Made with cachaça (sugarcane liquor), lime, and sugar. Fruit and sugar are muddled together, then the alcohol is added. Other fruits sometimes used include passion fruit, kiwi, and mango. Which of these foods and drinks would you want to try? Please share by commenting below! Any questions? Please ask! Yummy! They all look so good. I think I’d like that ceviche and acai. I’m not sure how you’d tell the difference with those fried pies. I’d like a shrimp one but I’d be disappointed if it ended up being chicken. I only tried the shrimp ones, and they were fantastic. Joe had a pastel stuff with beef, and he was a big fan! What if you’re a picky eater? Are there “American Food” restaurant options? Yes, there are, but you could just stay at home for that! Love you, Ray! Great post and you have made me so hungry! Love all the delicious fish and snacks you can get – the chicken empadas sound amazing! Sugarcane is one of my favourite things ever too! Thanks for sharing and I will be saving for later when I visit Brazil! All of the fresh fish and beach snacks were really tasty. Thanks for saving! I’m a big fan of the Brazilian steakhouses. I just can’t eat enough meat for those places. Thanks for pinning! Fascinating read! Rio is somewhere we want to go, but not really thought about the food. It sounds and looks delicious, we love fish so no problem there. The pastel pies sound interesting! I will pin your tips for a future visit, thanks! 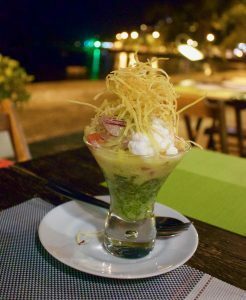 Rio is such a mix of different cultures, and the food reflects that. Thank you for pinning! These all sound delicious! I’d love to try the empadas, and of course I’m a big fan of caipirinhas. We have a similar sugar cane juice in Hong Kong and it’s always so soothing when you drink it warm! The empadas we found everywhere– from strolling vendors on the beach to upscale appetizers at restaurants. They are so delicious! Usually the beans and rice came together, but in separate bowls so you could decide how much you wanted to mix together. It all looks so delicious and exotic! 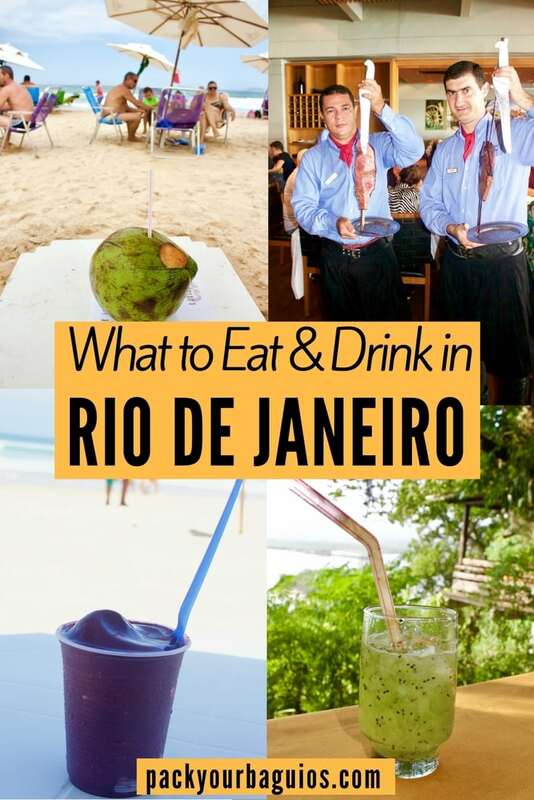 Would love to visit Rio and explore the Brazilian food and culture! The food is such an interesting mix of African, European, and Amerindian cultures. It was fun to sample all of the different combinations! All of this food looks incredible! The pão de queijo is calling my name though. I’m going to have to find a recipe and give that a shot. Hopefully one day I can make it to Rio and try it there. The pão de queijo was so much lighter than the cheese bread I was use to. I can’t tell you how many rolls I ate! Trying local foods is one of the best ways to absorb any culture, whether it is across the globe or across town. i am a great foodie and all these dishes looking delicious. i would like to have beans with meat if they are using halal meat. I’m not a big beans and rice eater, but Brazilians know how to make it so good, you’ll want it for your entire meal! I would like to try it all, Carmen. Thanks for supplying a list that looks so scrumptious! You’re welcome! We love to eat! Those Churrascarias look perfect for after a gym session! Imagine how much protein is in all that meat. 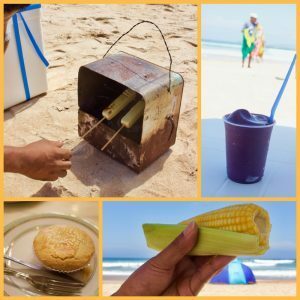 I didn’t know about all the beach food options, this makes the beach in Rio even more fun! We love our protein! The churrascarias are expensive but the meat is superior quality and as much as your stomach can handle! We love sea food. I think we will love Rio. Looks like a food paradise. Did not know about pastels. Always fun to discover new local dishes. Pinned for the future. 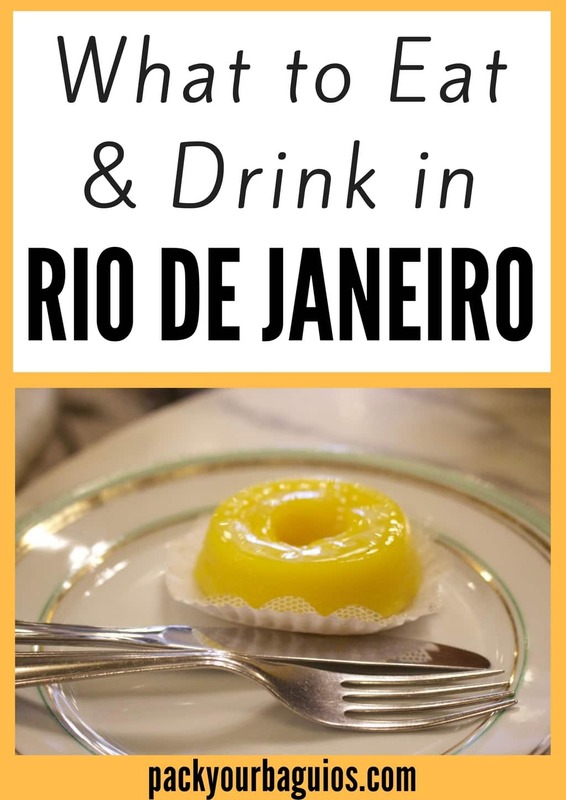 Oh my goodness… The food in Rio de Janeiro is totally up my alley! I can eat ceviche all day with cheese bread and kiwi juice. We were in Guatemala and Belize a few months ago and I was really surprised at how much I enjoy Latin American food. I’d love to try the food in Brazil one day! I don’t think I’ve ever eaten any Latin food that I didn’t love. The culture is all about food and family! I LOVED eating Feijoada! I could literally eat that all day and night. Other than Brazilian BBQ, I haven’t seen many of the other suggestions on here, so it’ll be nice to try some of these when I go back someday. Glad we could give you some more foods to try. I gained 5 pounds in a week, but trying all the delicious Brazilian foods was definitely worth the extra weight! It is nice to know that as a vegetarian, I won’t starve if I go to Rio. Rice and Beans sounds perfect for people like me. Sugarcane liquor is something I got to try. 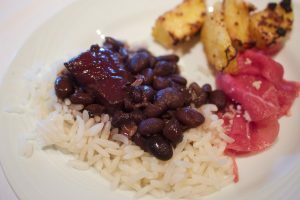 Yes, the black beans and rice most often comes without meat, and with all of the fresh fruit and vegetables, there’s plenty for people of all dietary needs to eat! The stew was such a treat. To have it served to us family-style and still sizzling and boiling was a delight to all the senses! The food looks really good!! I’m a vegetarian, do Brazilian restaurants offer these options? Definitely! Every restaurant we went to had a variety of options. Delicious! So one must watch ones weight when going to Brazil! Fortunately I am not a great foodie. I too liked the idea of mixing Farofa with other dishes. I did pack on a few extra pounds, but it was offset with all of the walking and swimming that we did. These looks so good! I love Brazilian cheesy bread. And all of the beach-side snacks look delicious! Ah the beach side snacks were great and didn’t have the calorie warnings. We did turn a blind eye to some of the rich appetizers and considered it a cheat day to eat them. Oh man! 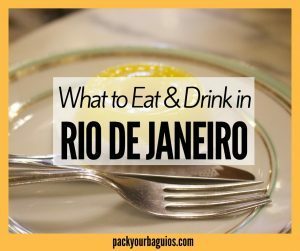 I am such a huge fan of just about everything you listed here but I’d have to say my go-to, always craving Rio food is the pastels. It seems counter-intuitive to want a hot, carb-filled snack on a hot beach, but I just can’t resist! Yum! Hi Spirited Sloth. Love the blog name and your content which caught my eye as a friend was affectionately referred to as a sloth for his leisure sleeping habits and patient carefree wanderlust. I agree with the counter intuitive hot carbs of the pastels on a hot beach, but then thought of following it with the cold carbs of a beer. A vicious carb ingestion cycle to culminate in a strange balance and resistance is futile! 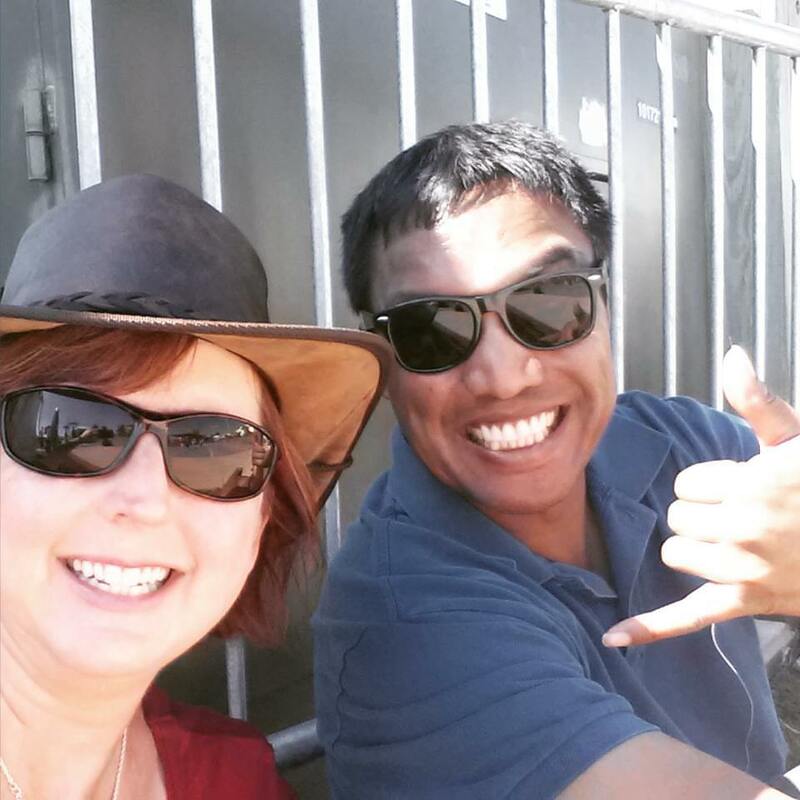 Follow Us to See Our Latest Adventures!